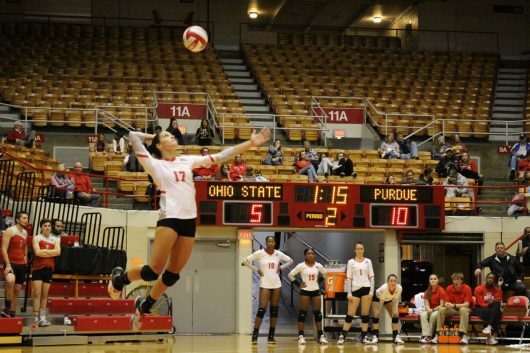 In a match consisting of both teams exchanging points back and forth in short rallies, Ohio State (12-13, 3-10 Big Ten) was unable to knock off the No. 4 Illinois (21-3, 10-3 Big Ten), losing in four sets. The Fighting Illini have now defeated the Buckeyes four straight times. The first set saw teams trade points back and forth, before Illinois grabbed a 14-10 lead, prompting Carlston to call a timeout. Ohio State fought back at 17-14, but the Illini pulled away late, going on a 5-0 scoring run and taking the opening set. In the second set, after a really nice block from Illini senior setter Jordyn Poulter, Ohio State pulled away late, tying the game 1-1 with a 25-18 victory. Franklin played one of her best games this season, tallying ten kills in 31 attempts, and also nodded seven digs. After Ohio State fought back after Illinois took a 4-0 lead early in the third set, Illinois went on a rally, extending its set lead to 16-8, running away with it late, winning the set 25-11. After getting as close as 13-10 in the fourth set, Illinois secured the win, winning the fourth set 25-19. Carlston said he felt Ohio State’s offensive and defensive effort, especially in the third and fourth set, was good. Ohio State will try and end its five-game losing streak Sunday, facing Northwestern at home at 1 p.m.